Deana joined the real estate industry as a recent business-school grad, working at a sales and marketing organization for luxury condominiums. Although she advanced quickly, she discovered that she didn’t enjoy real estate sales. Deana transitioned to construction the following year, working at an elevator company. During the next five years, she learned the ins and outs not only of elevator design and operations, but also of the New York City Department of Buildings Elevator Division. A few years later, the firm offered her—and she accepted—a position in the Certificate of Occupancy (CO) Division. “It seemed like a good fit and an exciting challenge,” she recalls. “COs require intricate knowledge of filing details, permitting, drawing reviews, existing construction vs. proposed.” She made the switch more than a decade ago, and she hasn’t looked back since. As the CO project manager, Deana reviews New Building and Alteration Type 1 applications and shepherds these complex projects through securing the initial CO. She studies filed, approved, and permitted projects, and she meets with clients to review and coordinate completion of all project requirements. “Every project has a timeline,” says Deana, “and it’s my duty to adhere to that timeline as closely as possible.” She accomplishes this challenging task by building relationships with all the project team members—including those at city agencies—based on trust, respect, and communication, with a healthy dose of time management. Of the many projects that Deana has guided through the CO process, she doesn’t have a favorite. “I’ve worked on many important and high-profile projects,” she says. “What’s really important for me is to get very clear on the client goals at the start and then to create a plan to achieve those goals.” That said, she confesses a special fondness for those projects where team members share her own fanatic attention to detail. “I love my co-workers. Every day, we communicate, resolve conflicts, listen, learn, collaborate, support one another, and laugh,” says Deana. Even though everyone is focused on work, they always find time for the social touches that add a human connection. 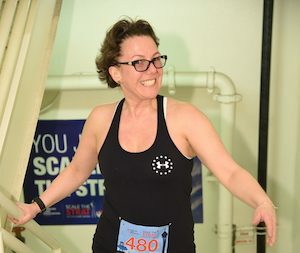 “We find a moment to stop, breathe, and think—becoming mindful of our strength, connection, and inspiration throughout life’s ups and downs.” But Deana admits that her view of One World Trade Center is a nice perk.